Tongue Depressor (New Haven, CT) is the duo of Henry Birdsey (fiddle, lap steel) and Zach Rowden (fiddle, upright bass). 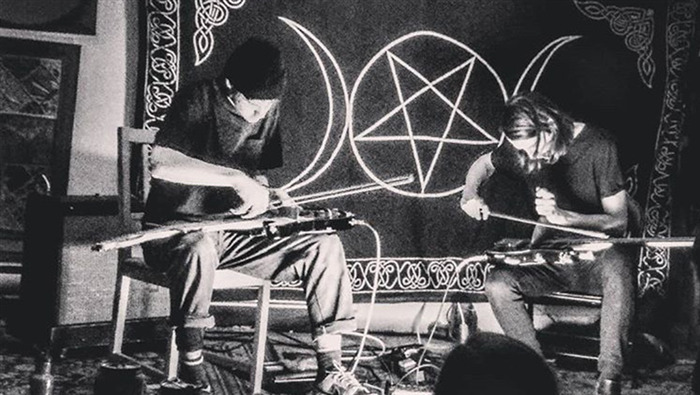 They write, improvise, and perform music that draws from the fields of drone, harsh noise, and church music, often using microtonal tunings. Recent projects and releases include the the ongoing Fiddle Music series (currently 4 volumes), Broad Is The Road That Leads To Death (2018 C/Site Recordings), and To See Not, a trio recording with percussionist Trevor Saint (Glockenspiel) out in January 2019 via Obsolete Staircases (Kentucky). Caspar Sonnet (lap-steel dobro) Kozue Matsumoto (koto) is an acoustic experimental, improvisational duo based in Los Angeles, California. Both artists employ numerous extended techniques exploring an array of interesting sounds and textures using both modern & early eastern/western folk instruments. Their collaborations are fiercely intensive, concentrated duals where both players utilize prepared strategies composed in set time blocks. Each player is then assigned a specific set of tools to manipulate various parts of the instrument and are assigned set tunings, microtonal or otherwise. Their use of instrumental augmentation, movement and presence are captivating to witness and mesmerizing to hear. Matsumoto/Sonnet are anticipating a record release entitled “Versus” on Sounds et all late August 2018.